Lego KidsFest Portland is October 11th, Plus a Giveaway for 2 Tickets! Update: Did you enter our Lego Kidsfest giveaway for 2 tickets? is the winner of the (2) tickets! Congratulations Chasiti. I will see you at Lego Kidsfest. 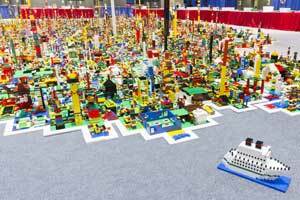 Are you planning to go to LEGO® KidsFest in Portland this year? We have never gone so I am excited to take the kids to it, it’s definitely going to be something different for us. Lego KidsFest Portland is October 11th 4-8:30 PM. Tickets sell out very fast so make sure to get yours right away. For a LIMITED TIME, Everyone Pays Kids Prices! Get your tickets here. One lucky reader will win (2) tickets to for the opening night session on Friday, October 11, 2013 (4-8:30pm). Make sure to like them on Facebook, Follow them on Twitter and find them on Instagram to get the latest ticket information. Winner will be chosen randomly by USFG and the ticket will be emailed to Emily’s Frugal Tips to forward to the winner.